A healthy, well-tended lawn enhances a home and increases its value, but no one wants to be a slave to their grass. 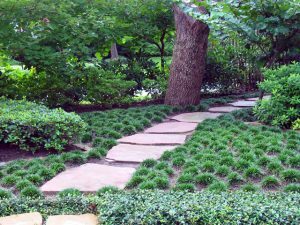 Luckily, today’s wider variety of grasses and increasing emphasis on low maintenance lawn and low water-use yards provide Fort Worth landscapers with an alternative to lawn care drudgery. The lawn experts at Bloom’s Landcare can guide homeowners to that perfect balance of beauty and convenience. Match the size of your lawn to the amount of time you want to spend mowing. Include automatic sprinklers to your design. Don’t put lawns on difficult-to-mow areas like slopes or paths. Use edging along gardens to give yourself a good mowing strip. Choose a variety of grass that best fits your type of soil, the amount of sun and heat the area receives and how the lawn will be used. Amend your soil if necessary and make sure the drainage is adequate. Install a reliable sprinkler system. Do the final shaping of the ground. Lay the sod or spread the grass seed. Adjust your sprinklers to the season and to periods of unseasonable weather. Eliminate weeds as soon as they appear, before they become a problem. Aerate your lawn every spring for warm-season lawns and every fall for cool-season lawns. Cut just the top third of the grass blades and keep your mower sharp. Low maintenance lawns provide all the beauty of conventional lawns with a minimum of ugly yard work, but it takes careful planning and installation to create them. The knowledgeable professionals at Bloom’s Landcare can give you the advice and guidance you need to make your dream lawn a reality. Just call (817) 688-5352 today to get started.